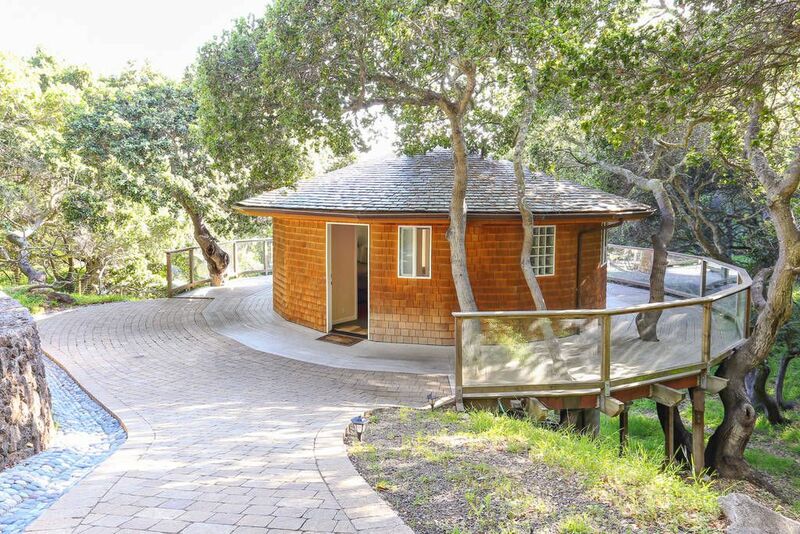 This is a beautiful, 20-sided shingled cottage set on more than an acre of oak trees, with views of the San Francisco Bay through the trees. The property is gated with off-street parking. This unique guest house offers one bedroom with a queen bed, and a full size sofa bed in the living room. Windows in every room look out into the oaks, where you can see deer, squirrels, and occasional rabbits. The cottage was built with the finest materials, including slate roof with copper gutters, bamboo and slate floors, granite counter tops, tumbled marble shower, and maple cabinets. A deck with glass railing encircles the entire house. There is a full kitchen with refrigerator, gas cook top, True convection oven, and dishwasher. Wireless high speed Internet and cable are included. The Bay View Cottage is just 2 miles from charming downtown San Rafael, and about the same distance to mountain biking, hiking, and picnicking at China Camp State Park. Don't feel like cooking? : The neighborhood grocery store is about a 5 minute walk from the cottage, and their deli offers an extensive selection of salads, sandwiches and pizzas, as well as complete gourmet meals. The wine selection is incredible, with wine-tasting every Friday evening. The bathroom is spacious, with a large tumbled marble shower, slate floors, maple cabinets, granite counter, and hand-hammered copper sink. It is stocked with shampoo and conditioner, blow dryer, extra toothbrushes, and beach towels. There is a partial view of the Loch Lomond Yacht Harbor and the bay. It is an easy 5 minute walk to the jetty for beautiful bay views. Forced air furnace heats the cottage in minutes. Extra down pillows and comforter supplied. We will gladly make arrangements to use the washer and dryer in the main house if necessary. Now with complimentary Tesla charging for our guests. Plenty of towels and hand towels. Beach towels for the hot tub! 2 x burner gas cook top. 360 degree deck wraps around the cottage. Deck goes all the way around the cottage. Hot tub on deck of main house with views of the bay is available for use (shared with main house). Please use at your own risk.